A reception and fundraiser highlighting the history of the New Haven Peoples Center will recognize the leadership of it’s president, Alfred L. Marder over a span of 80 years for peace, equality and justice. The event will take place at Coogan Pavilion in Edgewood Park near Whalley Ave and West Rock Ave. from 4 to 7 p.m. on Saturday, Aug. 6, also marking Hiroshima Day. 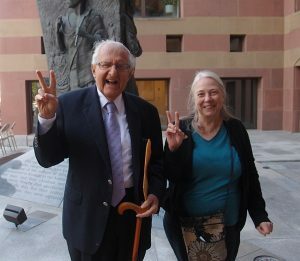 Al Marder poses with New Haven peace activist and Peace Council member Mary Compton at the Peace Day celebration at the Amistad Memorial statue outside New Haven City Hall Sept. 21, 2015. The statue was built thanks to his guidance and supervision. Marder is chairman of the Amistad Committee. A resident of Westville, Marder has been active in New Haven since the age of 14 when he was a student at James Hillhouse High School. He expanded his vision through participation in events at the New Haven Peoples Center. The Peoples Center was founded in 1937 to provides social, cultural and educational opportunities for the community. With Al Marder’s participation, it was the site of the first inter-racial theater group in the city called Unity Players. This was one of many efforts that broke down racial segregation at that time. Today the Peoples Center hosts the youth group New Elm City Dream, and is home to the immigrant rights group Unidad Latina en Accion as well as the SEIU 32 BJ janitors union and Greater New Haven Peace Council. The space is utilized by many social justice organizations. The event will include an exhibition of Peoples Center memorabilia, remarks by Marder and refreshments. Donations will be accepted toward the restoration fund for the building which was erected in 1851. The Peoples Center, a site on the Connecticut Freedom Trail, is currently raising $10,000 as part of a grant to restore the windows, roof and entry door. In his early years, Marder served as Executive Director of the Connecticut CIO Youth and Sports Organization and was President of the New Haven Youth Conference. During World War II and the fight against fascism, Al served in the U.S. Infantry from 1942-1946 in the European Theatre and received a Bronze Star. During the McCarthy period, as one who was persecuted for his ideas, he stood firm for civil liberties. He has supported every civil rights and workers rights struggle of his times. Marder is known for bringing to light the story of the Amistad captives and its lessons of Black-white unity to achieve freedom. Through all the decades, Marder continues organizing, educating and creating positive change. His depth of knowledge, commitment to equality, powers of persuasion and indomitable spirit inspire generations in New Haven and throughout the world. Requested donation at the door is $25 or what you can afford, no one will be turned away. Tax deductible contributions to the restoration fund can be sent to PERA / New Haven Peoples Center, 37 Howe St., New Haven CT o6511. 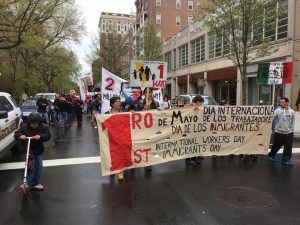 More than a hundred people marched through downtown New Haven Sunday May 1, in the annual immigrants’ rights action. An enthusiastic crowd led by Unidad Latina en Acción (ULA) braved cold May showers on May Day this year. The march included mostly young activists, children and college students. There were many signs and banners and robust chanting. No more deportations! 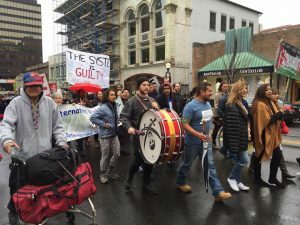 The marchers were accompanied by a lively group of very humorous and energetic “Radical Cheerleaders.” As the group walked down Chapel Street, the chants called for free education and free health care for all, as well as immigrants’ labor rights. 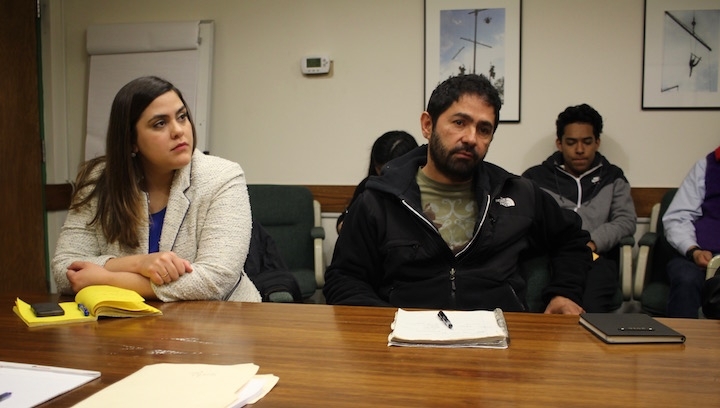 Yale senior Sebi Medina-Tayac, a member of the Piscataway Nation as well as ULA, said the group wanted to bring attention especially to immigrant labor in New Haven, which is concentrated in construction and food service. ULA works to create a vision for workers’ rights and freedom for all people based not only on lefty labor movements, but also to show the labor movement as something that’s diverse, changing, global and inclusive of people from all backgrounds regardless of citizen status or the color of their skin. Marchers stopped to chant in front of restaurants that they say have mistreated their workers. They said Atticus restaurant fired a long-time worker who spoke out against a pay cut and hired a union-busting firm to thwart the mostly immigrant workers’ attempt to unionize. The owner was not available and a manager said their policy was not to comment on the charges. The march also stopped at Calhoun College to protest the college named after an avowed racist. Thank you to New Haven Workers Association – Unidad Latina en Acción for continuing to fight for the dignity of all our communities! Together they seek to build unity for racial, gender and economic justice, including defending the freedom and dignity of and respect for all people and the planet. 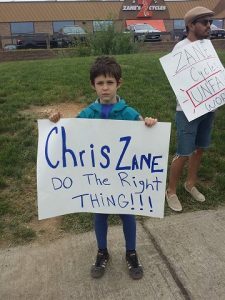 On May 21 workers and community members gathered at Zane’s Cycles (330 East Main St., Branford) to protest what they claim to be owner Chris Zane’s exploitative practices. In September 2015, workers at Zane’s Cycles facility voted overwhelmingly under federal labor law to bargain collectively for a workplace contract. The workers elected UFCW Local 919 to represent them in contract negotiations. Since then, Chris Zane has agreed to meet eight times to negotiate a contract with the workers. That’s eight negotiating sessions in 8 months. Workers say they feel exploited. 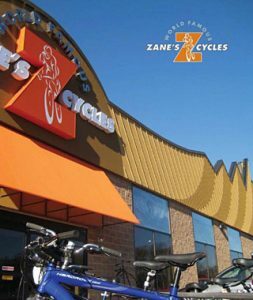 Because of the owner’s behavior, Zane’s Cycles has been charged with violating federal labor law. The charges are currently before the National Labor Relations Board. Workers and community members gathered to protest Chris Zane’s bad faith bargaining and his unfair labor practices. Press Contact: Jorge Cabrera (203) 499-8694. Members and friends of the Greater New Haven Labor History Association are invited to its annual conference and meeting on Sunday, June 5, from 1:30-4:30 p.m. at 267 Chapel St., New Haven. The conference, “Labor History: Looking Back, Moving Forward,” will honor the organization’s late President, Nicholas Aiello, showcase its 28-year history and discuss plans for the future. Author Anthony Riccio, who interviewed Nick for his books, The Italian American Experience in New Haven and Farms, Factories and Families will present “Sisters and Sweatshops: The Life of Nick Aiello,” and will give this year’s Augusta Lewis Troup Award to Louise Fortin, Nick’s sister and a retired garment worker. Frank Annunziato, outgoing Executive Director of the American Association of University Professors, University of Rhode Island Chapter, who co-founded LHA with Aiello in 1988, will discuss the organization’s mission and its early years, inviting contributions from others who were among its first members. The Director, Joan Cavanagh, and current Executive Board members, including Bill Berndtson, President, and Steve Kass, Vice President, will talk about LHA’s accomplishments during the first 16 years of the 21st century, including its work to produce a labor history curriculum for Connecticut’s public schools. As always, there will be time for refreshments and socializing. The organization’s troubadour, noted musician Frank Panzarella, will provide labor songs. If you want to learn more about LHA’s history, have ideas about how to move forward in the 21st century, and/or simply want to learn more about LHA, please join us on June 5th to look back at what has been accomplished and to imagine and plan the future. For more information, please call (203) 668-9082 or contact joan@labor.history.org. We are honored to welcome keynote speaker John Wojcik, editor of People’s World and vice president of the International Labor Communications Association who lives in Chicago. A panel including representatives of state workers and immigrants and those struggling for jobs in Connecticut will highlight key demands of the moment. The program includes a presentation of May Day Around the World, music and home made buffet. Donation is $5 or what you can afford. A fund appeal for the annual People’s World will be made. For more information, call (203) 624-4254. Brothers Axel and Henry Tubac worked for a company installing kitchens. For the first two years they were paid without fail. Then, for six and seven weeks, respectively, their employer stopped paying them. When they met with U.S. Rep. Rosa DeLauro at New Haven Legal Assistance headquarters Tuesday afternoon, the brothers still hadn’t been paid. They have filed suit against their former employer for wage theft. Lugo was arrested on Nov. 22 for disturbing the peace during a protest outside of Goodfellas. He argued that the police are more interested in harassing him for protesting rather than going after restaurant owners that are allegedly committing the far more serious crime of stealing from their employees and thumbing their noses at the law. This year’s annual conference and meeting of the Greater New Haven Labor History Association will honor the organization’s late President, Nicholas Aiello, showcase its 28 year history and give our members and friends an opportunity to brainstorm about the future. Frank Annunziato, who co-founded LHA with Nick in 1988, will give a presentation about the organization’s mission and its early years, inviting contributions from others who were among its first members. The Director and current Executive Board members, including Bill Berndtson, President, and Steve Kass, Vice President, will talk about LHA’s work during the first 16 years of the 21st century. Author Anthony Riccio, who interviewed Nick for his books, The Italian American Experience in New Haven and Farms, Factories and Families will present “Sisters and Sweatshops: The Life of Nick Aiello” and will give this year’s Augusta Lewis Troup Award to Louise Fortin, Nick’s sister and a retired garment worker. As always, there will be time for refreshments and socializing and our troubadour, Frank Panzarella, will serenade us with labor songs. If you have memories to share about Nick or the organization’s history, ideas about how we should move forward in this new century, and/or simply want to learn more about LHA, please join us on June 5th to look back at what has been accomplished and to imagine and plan the future of our mission to document and celebrate working class history.